The Richard & Kathleen Donnelly Family Foundation would like to thank you for your continued love and support over the years. Due to circumstances outside of our control, we have to cancel this year’s golf outing, scheduled for June 25. We will be in touch with details about our next event soon. We encourage you to continue to support JDRF this year if you are able. Any questions, please contact us at rdavis@daviscpagroup.com. Set atop southern New Jersey’s highest point providing views of the Philadelphia skyline throughout the course, Trump National Golf Club will astound. World renowned golf course architect, Tom Fazio, designed a property that is both beautiful and challenging. 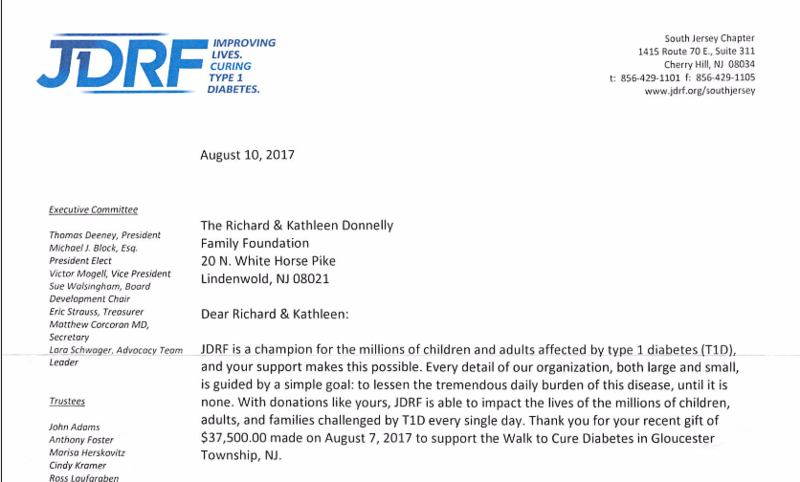 This money raised through this golf outing will go to Juvenile Diabetes research along with others, which has affected many people close to our hearts. With your help we can get one step closer to finding the cure to these chronic diseases. Take a look at video of the Golf Club: From the official YouTube page for Trump National Golf Club Philadelphia. A fully-private golf club and clubhouse with breathtaking views of Philadelphia.